Beth and Matt from St Austell Printing Company have just returned from the latest “Power of Print” event at the iconic Stationers’ Hall in London. 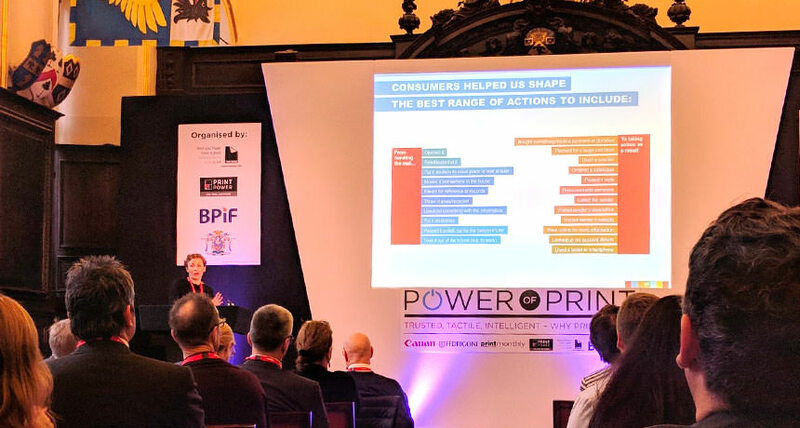 Organised by the BPIF, Print Power and Two Sides it’s a great opportunity to share in the latest developments in print research and trends from other industry experts. This is useful, because not only does it help us to keep at the forefront of our industry – but there’s some useful research we can pass onto you to help your investment in printed marketing go further. There was a common theme throughout the day – Print creates an emotional connection with the reader. Because it’s a multi-sensory experience, your brain reacts and retains the information differently to other marketing platforms. William Sitwell is a writer, broadcaster, Masterchef judge and Editorial Director from John Brown Media. He shared his passion for print and it’s place in this multi-platform world. In William’s own words: “Print is alive and well and remains at the forefront of marketing”. William leads a team that puts together marketing strategies and produces content for some of the World’s biggest brands, so is well placed to appreciate the importance of print in the marketing mix. One of the brand they work with is Waitrose. Figures have shown that customers who read the magazine go on to spend on average five-times more in-store than those who don’t. He also felt that people can own print in a way you can’t with any other digital content. You can file it away, leave on display or share a printed magazine. It’s a physical item which you feel ownership of and therefore has more value to the reader. When it comes to marketing, using print is about quality over quantity. As SAPC’s Jon Hart previously discussed, when you receive a physical piece of marketing you have to spend time considering it’s content. It’s in someone’s consciousness for longer than a digital advert could ever manage. It’s about using different metrics to show how effective print is, especially when it’s compared to digital platforms alone. It’s not just about the number of times you get in front of someone. It’s firstly about whether your message actually gets seen, and the “dwell time” – the amount of time someone’s eyes will stay on your advert. Abba Newbery from Lumen Research does some exciting stuff with eye-tracking technology, revealing the “hot-spots” on both print and online platforms – ie, the areas people look at for the longest amount of time. The trend shows that 75% of printed adverts are seen. Printed messages had a dwell time 2.2 seconds, compared to digital ads that only held attentions for 0.9 seconds. Also, the average Times reader will spend 42 minutes with their paper compared to five minutes on news and information websites. Ultimately, the quality of time spent with printed marketing equates to a better return on investment. Seiran Hanner from Royal Mail MarketReach explained how a new joint industry committee formed of some of the UK’s leading delivery specialists to create a standard measurement for mail that will accurately record the real reach and frequency of mail. In a world surrounded by digital advertising, marketeers have instant-access to detailed reports. Who saw their message? When did they see it? How did the act on it. This level of reporting has been hard to replicate until now. 1 in 5 mail items are “still live” after a four week period. This means that the mail is still in the possession of the recipient and able to be acted upon. Mail as a signpost to digital platforms is very powerful. Of the people who act on a piece of mail, 70% will continue their journey online. A large proportion of people ‘look forward’ to receiving mail addressed to them. It makes them feel special and valued. If your a marketeer or agency who has often struggled to report on the effectiveness and ROI of a print campaign against digital, then we can help. There’s lots of other learnings from the day too – we’d love to share them with you. Please get in contact with us to find out more.